Cheese is loved in all and every form it comes in. This spreadable variety is easily available in the market by many brands and have a very unique taste. Usually they are made of soft cheese that make this it so spreadable and are the ideal party dip alone or with a little garlic, chilli and pepper! The cheese is also spread over plain sliced bread as a snack. Sometimes kids do not like to eat the healthy rotis and theplas. In such cases the best thing to do is innovate and make something fun that the kids will love. Spread some cheese on theplas, stuff it with a filling of your choice and your Cheesy Thepla Potato Wraps are ready! These are the perfect snacks to pack in the tiffin for school. We all have heard of cream of tomato soup but here we have the Cream of Eggplant Soup! The innovation here is that instead of cream, we are going to use cheese spread. In this recipe, the smoky charred flavor of the eggplant is complemented by creaminess of the spread and the freshness of basil. When you think of cookies, your head does not go to cheese first. But these amazing Cheese and Oatmeal Cookies will definitely make you change your mind about that. These savory cookies are flavored with cumin and pepper, which elevate the taste of the cheese in them. 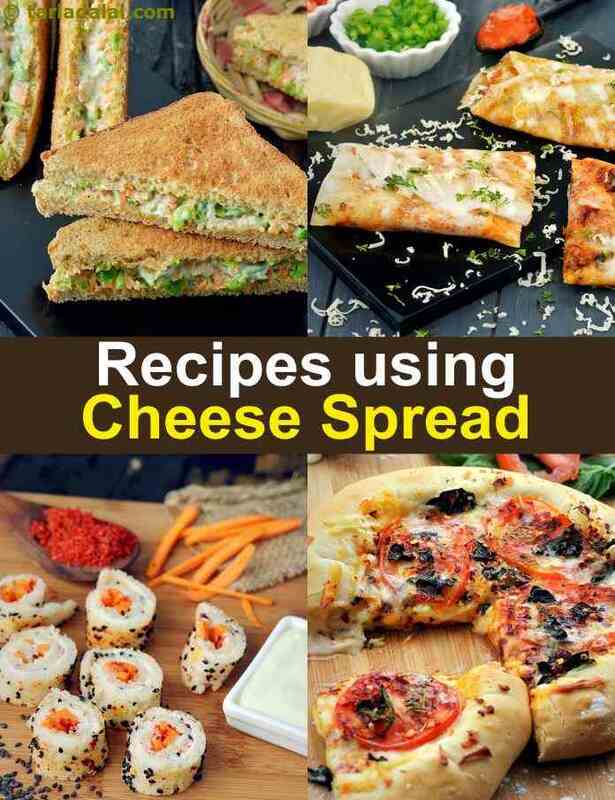 Anything that has cheese spread added to it immediately becomes everyone's favorite snack, whether it is a simple sandwich or something that requires a little more preparation. The Three Layered Grilled Cheese Sandwich is a combination of three different types of cheese, with a little ketchup and chilli flakes to give it a little kick. It's easy to make and requires no sort of prep beforehand and that’s why it is the ideal snack. Cheese spread is also ideal for a dinner party. Cheese Carrot Canapes, even though take some effort to make, are a great starter to serve at a dinner party! Like I said before, this spread can just be had plain or be made into a dip where you can either stick with the classics or make something a little more unique. The most basic would be a delicious Cheesy Pepper dip which can be whipped up in a jiffy or you can even try the Dabeli Cheese Fondue combining the cheesy flavor with an Indian palate. Using cheese spread for dishes that can be served as a main course really shows its versatility. The homemade Four Cheese Pizza made with this spread will most definitely blow your mind. The melty cheese with a really soft dough, topped with a tangy tomato will be your preferred choice over the store bought pizza for sure! Cheese spread also adds a certain creaminess to Chilli Cheese Paratha to counter the crunchiness of the onions and the chillies.